Movies were experimenting with color at least a century ago, and the 1930s saw the rise of the Technicolor process in films like Gone With The Wind and The Wizard Of Oz. But color did not really become an industry standard until about the 1960s or so. That was the last decade when movie trailers and posters felt compelled to add the words “in color” as a sales pitch. Now, all mainstream films are expected to be in color, and black-and-white movies are relative rarities. Like sound and 3-D, color can help a director tell a story or set a mood. 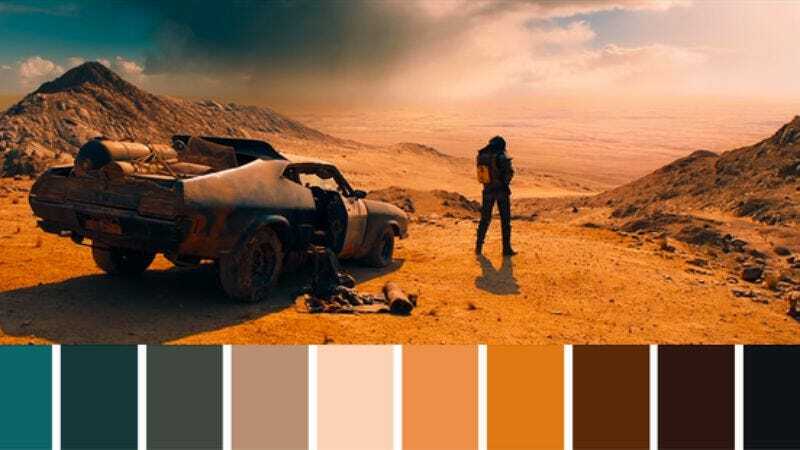 The Twitter account Cinema Palettes is a unique and interesting tribute to the many ways in which directors have chosen to employ color in their films over the decades. Each tweet contains a still from a famous motion picture accompanied by a “homemade colour palette” that isolates the various hues contained within it. Here is a recent representative example from John Landis’ The Blues Brothers. This is a scene that takes place at dawn at a dusty, drab location (a prison), so the palette is necessarily limited. Here’s another, based on on Disney-Pixar’s A Bug’s Life. Clearly, this is a more vibrant, eye-catching moment, the kind of scene people use to calibrate their flatscreen TVs. But sometimes, the most interesting tweets from Cinema Palettes are based on movies that no one has thought to analyze as visual art. Take, for instance, this contemplative moment from Chris Columbus’ Home Alone.